This is one of the ways of retaining customers because, those of you that have listened to me, harp on about this know exactly what I am talking about. Once you get that first purchase, you have made a lot of effort to get the person there, to buying something. And a lot of people then just give up. You know that’s it. Job done. End of the work. But no. For me that is the start. Once you’ve got someone in, they become the ultimate lead. They are a customer. But they’ve only bought once. You want them to buy all the time. So anything that can make them go from a customer to a repeat customer and into a regular customer is going to be a good thing. 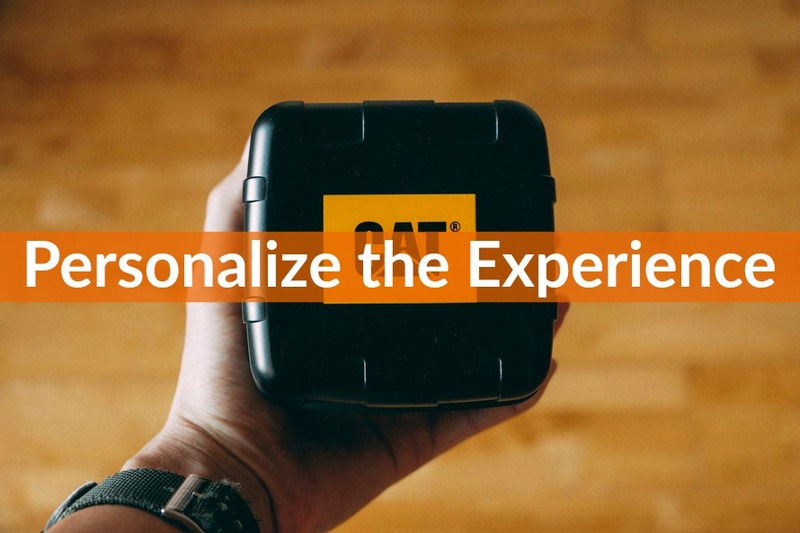 So personalize the experience. No matter what product or service you provide. Try and think, if you can give a level of personalization. Because if you do, if you give something that is personalized to a specific person, they will stay with you. If they go elsewhere, they are not going to get the same. They are going to be treated special, in a special way by you. They aren’t just going to be a number by someone else. So for example, if you buy a Range Rover car. Yes, top luxury car, lovely, wonderful. At the top they have a section called the autograph section, where you can have it pretty much any color, you can have your initials, your monogram sewn into the leather of the seats. You can have all sorts. Now this is for very wealthy people. But the reason Range Rover does this, is because the people who can afford it want it. Who else is offering it? Can you get that from a Volkswagen? No. Exactly. Can you get that down your Ford dealer? Now I know it’s not the same. But do you see, the luxury ones, the ones who spend the money, get the personalize services what they want. In fact if you buy an Austin Martin or anything like that, you can get it personalized. You think, WOW! of course for the money. So why not try and figure out how you can do that in your business. So if you have a customer that buys a particular product from you all the time, how about if you can have it somehow, if they order in bulk, if you encourage them to order in bulk, offer it to be screen printed with their logo on it? In the old days, years ago, in my business, one of the things that I sell is fire extinguishers. Many many years ago in the UK, the biggest company in the UK was Chubb Fire. They approached Harrods. Harrods the department store, the famous department store. And they produced a sample mock up for them because they are doing the factory. Where they produced a fire extinguisher in the Harrods Green, which is kind of Olive green color and they had Harrods logo instead of the normal logo, they had the Harrods logo at the top, and the label was in the Harrods’ gold writing. Now they produced that as a mockup. Harrods then dropped whoever was their current supplier, threw out all their fire extinguishers and bought a whole lot from Chubb, and were then a Chubb customer for years. Now think of what you can do to personalize. Could it be adding initial, could it be putting a sticker on, could it be something as simple as putting your clients into a group where it makes them feel special. So they are a gold level client, or a platinum level client. Or a silver level client. And you may think to yourself, oh hang on, if I, say if I’ve got a gold level, and I tell someone there is a silver level, is that telling them that they are not quite as good as those? No. Because all of the airlines have these levels. And you will have them aspire to be a gold level. You can tell them what it is going to take to be the next one. And they want to get there. You can also point out that being silver is great. There is a bronze, and there is a nothing. Everyone else. So they are already special. And if they do this little extra, if they commit just this extra bit, they will get that. So this is thing you want to offer personalization wherever you can. But if you can offer extra special things to your top customers, you will retain your top customers. Do you see where I am going with this? It’s all about retention, it’s all about keeping hold of that customer. So it’s not just personalization in speaking to them on a one to one. I mean putting effort in. So if you produce reports for a company, make sure it has their logo on. Make sure, don’t worry, they’re not really interested in yours. Make sure it has their logo. It looks good for them. It’s theirs. They take ownership, you’ve done this for them. If you provide Linen Laundry service for someone and you provide washing linens then how about putting their logo on it? Something like that, because who else is going to do it? There’s all these things you can do. Just think. Now in some instances, some industries, it’s just not possible. It’s just a commodity product, and, or they buy too many, or you got too many customers, very difficult. But are you sure that there’s not just one bracket of customer or client that you have that you could put some extra effort in and do something special for them. Something with their name on it, something just for them. Perhaps you don’t make anything, you don’t manufacture, s0 speak to your suppliers. Ask them if this is possible. I mean we supply fire, high visibility safety vests, you know the things people wear for road work or construction sites. If people order enough, we will produce them with their logo on them for no extra cost. And that’s our supplier that does it. People love it because they are not going to get those off the shelf and it’s great for the ego. If you’re producing in safety gear, like health helmets and things like that safety helmets, enabling with a logo. You don’t have to print them, you can make stickers. Have stickers made and put them on. Go that extras expense, have the stickers made and give them to the clients to put on their things, etc. that kind of thing. Just think about it, it can apply to anything. Now today is a Monday, lovely sunny Monday. And as always we have Book for the Week. Now this one is sort of strange one because this is the Robert Collier Letters Book. 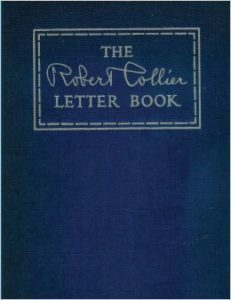 Now it’s a book that’s been compiled of old Robert Collier letters. He was copywriter years ago. Most of the great copywriters are from the first half of the century. And someone has put together, compiled all old copies of his letters. So these were example of templates, these are things that worked. And when you are writing, when you are designing quotes or you are writing sales pages, or emails to people, or trying to sell something, or trying to market. These are fabulous fabulous examples. It’s probably one for virtually everything you can use. 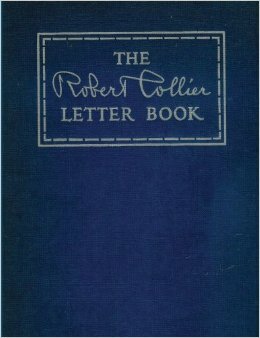 So the Robert Collier Letter Book. You can, usually get it from Amazon. It’s quite a big book, I think its 300 or 400 pages. But it is excellent and excellent reference guide. I’ll be back tomorrow.